Well, Hollywood has remade Red Dawn, and the foreign-policy wonk community is baffled. The 1984 original (directed by John Milius) depicts the trials and triumphs of the Wolverines, an all-American teen guerilla squadron that defends Colorado against invading Soviet, Sandinista, and Cuban forces. (The film was so culturally influential in the United States that the 2003 operation to capture Saddam Hussein was named after it.) The 2012 version takes place in Spokane, Washington. Barack Obama is president, and the attack is happening on his watch. The remake updates the villains to North Korean troops—aided by Putin‘s Russia—who conquer large chunks of America with their warplanes, electromagnetic pulse machine, and use of anti-Wall Street propaganda. What!? Really? How are the North Koreans gonna get here? We’re talking about thousands of miles. Did they stage an amphibious landing like we did in Normandy? Did they fly over? Each of the pilots in their air force only flies four hours each year! Their military is in terrible shape, they don’t have enough fuel, and they don’t have the artillery. Like, how exactly is this going to happen? The premise is actually no more absurd than Independence Day, or the aliens in the new Battleship. So to pose the North Koreans as a credible threat to the continental United States is as ridiculous as the spectre of all-out alien invasion. Also, how exactly would they get from there to here?? Uhhh…… Obviously the premise is entirely ridiculous. There have neither the money nor the military capacity to reach us. It’s fantastical. Yep. 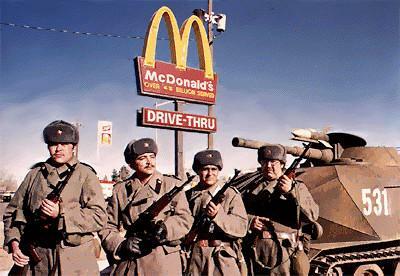 Red Dawn gets a wide release on Wednesday, November 21. The film is rated PG-13 for sequences of crushingly dumb but somewhat enjoyable escapism involving explosions and gunfire. Click here for local showtimes and tickets.